Last week I finally got round to tracking my 168 hours for Laura Vanderkam. When I first wrote about this, I worried that the Hawthorne Effect would make the recording exercise invalid. I decided not to fight it, and instead used it as a time management exercise. Instead of tracking as I went, I filled out Monday-Friday on Sunday evening. Then, I just adjusted stuff as I went through the week, but it definitely made me more mindful of how I was spending my time. There weren't any big surprises because I obsess about this kind of thing already, but the colour-coded week makes me disproportionately happy. You can see at a glance how different the front and back of my week looks. Green is work and orange is time with the boys. Monday - Wednesday I spent on average just 1.5 hours per day with the ginger nuts, whereas on Thursdays & Fridays I spent 6.5 hours with them. Something I notice about the way we do things versus a lot of other people is that we prioritise me-time (i.e., gym) & minimising childcare by dividing and conquering. During the week we have very little time with all four of us together. I realise this wouldn't appeal to a lot of people, but I think it's totally worth it. Divide & conquer. Tag-team parenting. We may take it to an extreme; we do quite a bit of this at weekends in order to go shopping, have haircuts, etc. It might be an idea to plan at least one family activity per weekend. The most amazing part of the week? Do you see Sunday? There is a huge chunk of "family chill time." I KNOW. I did not believe there could be such a thing. We are creatures of habit. We go to the gym on Sunday mornings, with childcare from 9:30 - 11:30. (Have I mentioned how much I love our gym? Yes, it's expensive, but the monthly fees include 2 hours of childcare per day.) We usually meet up with another family afterwards, go swimming and have lunch. It's great. But this Sunday it really felt like we turned a corner. It was warm, so we were outside where the children can run free. There are woods for them to play in. It's all very wholesome. Anyway, both Tom & Harry had friends to play with (Tom's old enough to have a self-selected best friend! ), and everyone had such a nice, chilled-out time without needing constant attention. Plenty of adult chat-time and time to read the newspaper. Next week I'm going to bring my knitting. Hurrah for Springtime and a play pick-up joint rather than play-date. Alison- thanks for posting this! 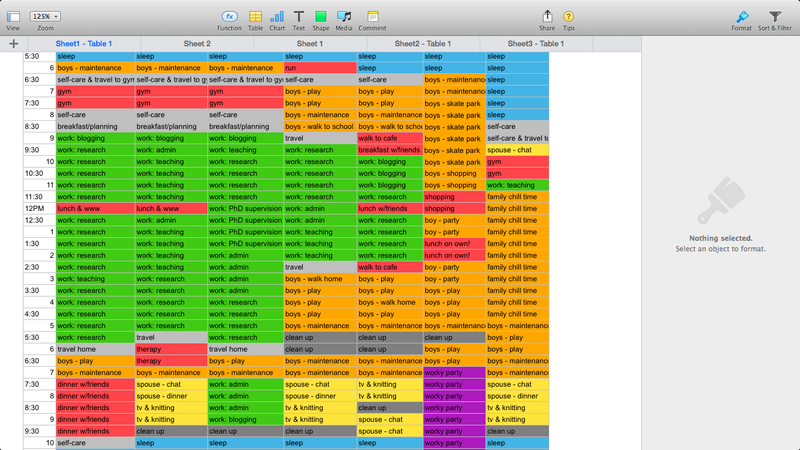 The color coded version of your "mosaic" is pretty typical -- people front load the week with work, but the back half is much more family and relaxation oriented. When we think of our lives, we often think of Mon-Thurs, but Thurs-Sun is just as valid a sample! The family chill time sounds sweet.